They're Trying to Ban Kids From Using Tanning Beds, Which Should Probably Already Be a Rule? The Colorado high school I attended in the 1990s had a designated student smoking area. At Smokers' Corner, school security guards bummed cigarettes to 18-year-old seniors, seniors sold packs of cigarettes to underclassmen, and a visible smoke cloud loomed overhead during finals. Crazy, right? How things have changed over the last two decades! Except, in some ways, they haven't changed at all. Take tanning beds, for example. The FDA is pushing to ban their use by kids under age 18. But since tanning beds actually cause more cancer than cigarettes do, that pre-prom bronzing package is just as nefarious as a trip to Smokers' Corner was back in the day. If not more so. Which makes one wonder: How is this not a law already? Legality varies by state, but there are still eight states with absolutely no tanning restrictions, and 19 states that allow minors to tan with parental consent. Rather than hunt these kids' parents down and publicly shame them, we asked three dermatologists just what the hell those people are thinking. The perfectly bronzed ideal persists thanks to aggressive advertising on the part of tanning bed companies and lax enforcement by authorities, says Dr. Gary L. Marder, medical director of Marder Dermatology and Skin Cancer Center in Florida. "Tanning companies are still targeting minors and young adults with their advertising," he says. "People feel that they look so much better and their skin seems smoother when they're sporting a nice tan… Many states have laws in place regarding minors and tanning, but have done little to enforce rules." Defending children's right to expose themselves to deadly carcinogens seems pretty unthinkable, yet plenty of organizations do it in the name of "business," including a newspaper in my home state of Louisiana. "Teens make up much of the clientele, especially near prom and homecoming dances, special events and before the summer months hit," it reads. 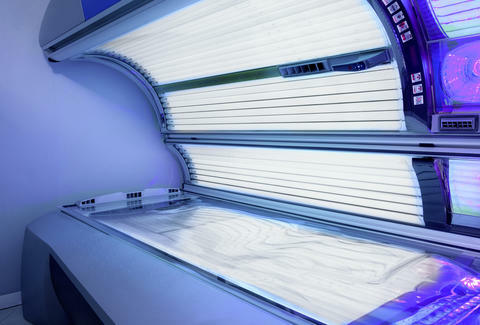 "If this bill [outlawing tanning bed use by minors] passes, it will also put a dent in the pocket of many business owners and the sales tax revenues for municipalities." Oh no. Won't somebody please think of the tanning salon franchisees? "This is a $2.6 billion industry," says Dr. Delphine Lee, dermatologist and director of the Dermatological Center for Skin Health at Providence Saint John's Health Center in Santa Monica, California. "People have argued that the FDA is going after women who own small businesses. I understand you're trying to find angles, but tanning beds are just a health hazard. It would be nice if we didn't have them at all." Although tanning beds are classified as carcinogens by the World Health Organization, it's not uncommon to find them in apartment complexes, near college campuses… there's even one in my gym. That's one reason for the increase in melanoma, which has been rising at a rate of 2% per year for the last 20 years, says Dr. Tsippora Shainhouse, a board-certified dermatologist and pediatrician. Melanoma rates are rising in both adults and kids, but in no population are they increasing more drastically than in girls and women ages 15 to 29. "Melanoma is the most common cancer in women ages 25 to 29 and the second-most common cancer in women ages 15 to 29," says Dr. Shainhouse. "I've treated patients in their 20s, 30s, and 40s for basal cell skin cancer, squamous cell skin cancer, and melanoma. Most have admitted to tanning in salons and lying out at the beach and getting sunburns when they were younger." Right now, a lot of people still subscribe to the belief that a tan is a good thing and a sign of health. We're long overdue for a paradigm shift, Dr. Lee says. "Just as we knew tobacco smoke has carcinogens, we know UV light causes mutations in the DNA, but it takes a while to get past cultural acceptance of things like laying out in the sun or going to tanning beds," she says. "We walk in the sun all the time, so it's hard to get that concept." Missy Wilkinson is embarrassed to admit she used tanning beds five times when she was in high school, but at least she wasn't a regular at Smokers' Corner. Follow her on Twitter @missy_wilkinson and Instagram @nowlistenmissy.